The most commonly-asked question of motoring journalists is, “What’s your favourite car?” Which leads to a dilemma. Do you tell them the truth – and generally disappoint them – by saying that it varies according to the circumstances and location in which it’s to be driven. Around the inner city it would be small economical hybrid; on the motorway a comfortable cruiser; off-road, a rugged 4WD or ute. Or to tell a little white lie and give them what you know they really want to hear – Ferrari, Lamborghini, Porsche… etc. So it’s with a measure of relief that I can now respond with a clear conscience, while dropping a few names along the way; that my favourite car is the BMW 630i M Sport Gran Turismo in which I chauffeured a very good friend who invited my as a guest when he was recently presented with an Order of Australia medal by the NSW Governor, The Honourable David Hurley. 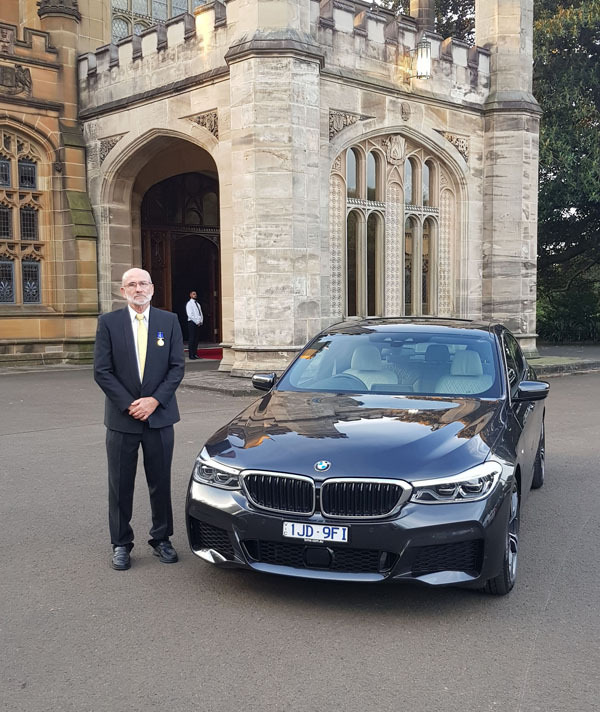 The big Beemer attracted plenty of admiring looks as we proceeded through Sydney as well as some positive comments from the various officials that ushered us along as we took pride of place in the Government House carpark with its views over the Bridge, Opera House and harbour. 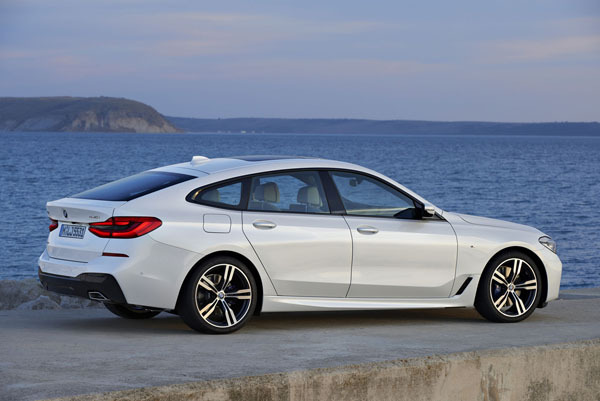 But enough of my ego tripping, what is so special about the BMW 630i GT? 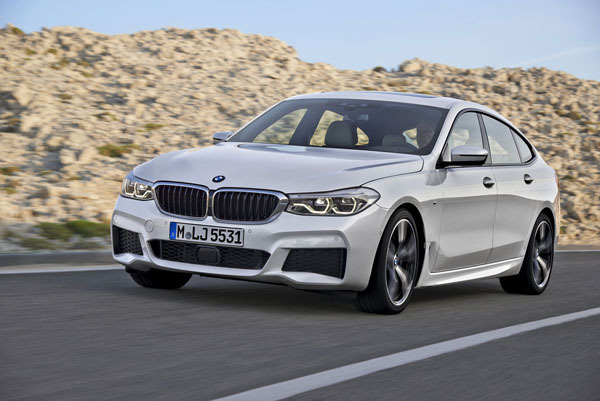 While it’s based on the same platform as the 5 Series the Gran Turismo’s is much more stylish than the conservative 5, with a tapered roofline that justifies, at least in BMW’s eyes, for them to describe it as a four-door coupe. At 5091 mm it’s 87 mm longer and at 1539 mm is 20 mm lower. While fuel consumption isn’t likely to be a significant factor for buyers of a car that starts at $123,500 there are environmental benefits of using the official number of 7.0 litres per 100 kilometres. The BMW 630i GT is powered by a 2.0-litre turbocharged petrol engine that generates 190 kW, and 400 Nm from just 1550 rpm. A high-performance variant is also available. Powered by a 3.0-litre V6 petrol with a twin-scroll turbocharger the BMW 640i xDrive reaches 250 kW and 450 Nm. The xDrive indicates that it has all-wheel drive. Fuel efficiency is helped by the car’s lightweight structure and enhanced aerodynamic features such as an adaptive grille which opens and closes depending upon differing cooling needs and air breathers behind the front wheels. Both models have eight-speed sports automatic transmission with steering wheel mounted gearshift paddles. 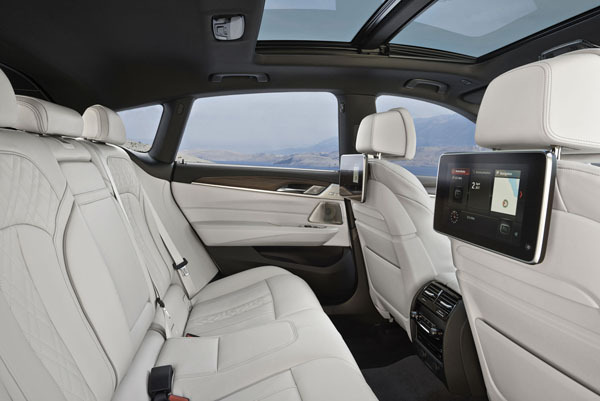 Our BMW 630i had a bright and pleasant interior courtesy of cream Dakota leather upholstery and a panoramic glass sunroof. When they weren’t exploring the various features around them – or giving mock royal waves along the Government House driveway – our two rear seat occupants loved the space and comfort provided to them. There’s a 610-litre boot, extendable with 40:20:40 rear seatbacks down. Automatic tailgate operation is always fun. Both variants use BMW’s iDrive6 infotainment system displayed on a 10.25-inch touchscreen in the centre of the dashboard which can also be controlled by either the traditional rotary dial mounted on the centre console or by voice control. Directly in front of the driver is a 12.3-inch multi-function instrument display screen that can be customised to the driver’s preferences. The sound system is a16-speaker Harmon/Kardon unit, there are two USB sockets, extended Bluetooth functionality, DAB digital radio and a wireless smartphone charging pad. In addition to the standard range of safety equipment the 6 Series sedans have a package of advanced features called Driving Assistant Plus that include active cruise control; steering and lane control assist; lane keeping assist and departure warning; active side collision protection; front and rear cross-traffic warning; crossroads warning; evasion aid; and rear collision prevention. Both variants also get enhanced M Sport brakes. Also standard is Parking Assistant Plus which includes automated parking; front and rear park distance control; and front, rear and top view cameras. There’s also a head-up display to reduce the amount of time the driver’s eyes are diverted from the road ahead. The BMW 630i is a natural grand tourer – our down and back cruise along the M1 between the Central Coast and Sydney was smooth and relaxed both for the car and its occupants. The interior is extremely quiet. Although there’s good visibility to the front and sides the larger A-pillar can cause problems around town and likewise the sloping angle of the hatch also restricts rearward visibility. Once back to driving solo we took off into our normal semi-rural route where to try out the BMW Adaptive 2-axle air-suspension system. There are three modes the names of which effectively explain their purpose: EcoPro, Comfort and Sport. Switching to Sport mode allows the car to lower itself by 10 mm and raise the rear spoiler for improved grip and traction. Alternatively, the height can raised by up to 20 mm to provide extra ground clearance for low-speed driving on uneven roads. The eight-speed gearbox is smooth and fast with shift paddles for DIY changing. While it’s unlikely that many buyers will be throwing the big Beemer around corners it’s reassuring to know that because it sits relatively low it can be done safely. At the end of our week with a blend of urban, highway and country driving fuel consumption averaged out at a very acceptable 8.1 L/100 km for such a large vehicle. It’s difficult to categorise the BMW 630i Gran Turismo. It looks like a coupe, but with the convenience of four passenger doors, a load area that’s almost to the level of a wagon and with its air suspension raised to its highest level isn’t that far short of an SUV. With its high quality interior finish, comfortable seats, large windscreen and side windows and panoramic sunroof it’s a lovely vehicle to just sit in. Although it’s natural habitat is the German autobahn it cruises smoothly, almost silently and economically on our much slower motorways. All in all a very impressive and versatile vehicle.